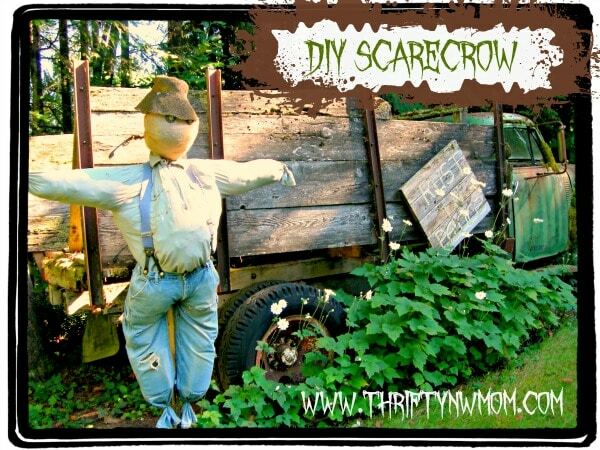 DIY Scarecrow – How to Make A Scarecrow with Items Around The House! This project is so fun! The scarecrow above was made to look like my kids’ papa (that’s what they call their grandpa), and my mom (his wife) did a great job, simply by using his old clothes. Whenever we drive past him the kids all yell “hi papa!”. In fact when I was getting the photo above ready, one of my little ones saw me working on it and said “look, there’s papa!”. 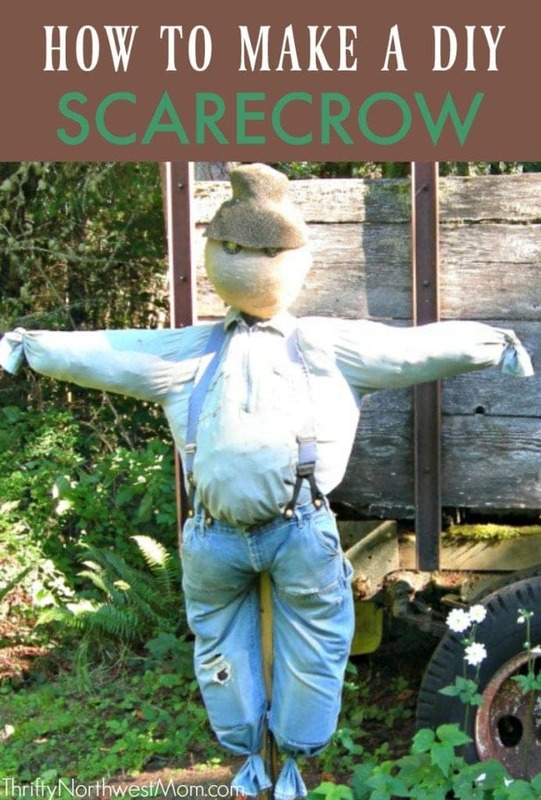 Whether you choose to make your scarecrow look like a family member or not, they are fun and easy to make. Best part is you can use many items you may already have lying around the house. *Optional – pick up some real hay to stuff in the arms and legs (and neck) if you want a more traditional look. That is just about all you need to make your own DIY scarecrow!! Lay your outfit out and tie off each arm and each leg with a rubberband a few inches in. This will keep your stuffing in and also creates the illusion of hands and feet. Once you have the arms and legs tied off you can start stuffing. Add your bubble wrap to your pants and then top. We secured the top to the pants with suspenders. You could also use safety pins instead. If you do not have bubble wrap, you could use old newspaper or whatever recyclable material you have. In that case, you would probably want to keep the scarecrow under cover. To make our head, we used a large balloon and covered it with burlap and tied it to the top of our stick. If you are using your scarecrow someplace you are concerned that birds may land on it or other critter, you may want to opt to stuff the head rather then use the balloon method. We then used a hot glue gun to attach to large buttons for eyes (you could use bottle caps too – if you don’t have buttons). Attach either to a stick or add a hook to the back to hang on a door! We cut a small hole in the back of the pants (so you cannot see it from the front). We then ran the stick up through that hole, and out the neck of the shirt to attach our scarecrow to the stake (make sure you do this all behind the bubble wrap). Lastly, top it off your scarecrow with a hat, and enjoy! Want a more authentic scarecrow look? Pick up a little hay and add it as hands and feet, and a little coming out the neck area. My kids just love this scarecrow, and will remember it each year I am sure. It was so worth a little effort and a few materials we were able to scavenger from around the house, for the memories I know they kids will always have of “papa”!